The concept of the net zero energy (NZE) is a mature one, with established technology providing a clear path, especially for low- and mid-rise buildings. A few years ago, the chances that a new building project would pursue net-zero-energy (NZE) use were pretty slim. But in the last year or so, the concept of NZE has rapidly matured, and more and more projects are using it as a goal. So, what made this possible? And should you be considering NZE for your next project? To start with, ever-more-efficient building codes, more affordable glazing products, the emergence of LED lighting, and the availability of cheap solar have all combined to make NZE very attainable for certain types of projects. NZE has also started to become a formal goal by building programs and codes, notably by California, which has a formal NZE goal for all new residential buildings by 2020, and all commercial buildings by 2030. We’ve also had the benefits of recent projects that show us opportunities and constraints, such as NREL’s Research Support Facility in Golden, Colorado, RMI’s new headquarters building in Basalt, Colorado, and the Bullitt Center in Seattle. But perhaps what is most amazing, is that if you’re designing a one- or two-story building, you’re probably pretty close to NZE-ready just by meeting code, and all you need to do is add onsite photovoltaics. If your building has three or four stories, you should be considering NZE and be working to optimize your energy efficiency, and maximizing use of your roof area for solar power. For a four- to six-story building, NZE is still possible, as the Bullitt Center has shown us (using an extended roof canopy to create a solar collection area larger than the building footprint), although you’ll also need dedicated attention to energy efficiency and energy management. Beyond six stories, you’ll have to look for additional resources. Either you need façade-integrated solar (on the south façade), a non-building, onsite renewable installation (e.g. carport solar), other onsite renewables such as wind or waste-to-energy, or some kind of off-site solution, such as ownership in a community solar installation. A couple assumptions we've made: these assessments presume that you have good solar access on your roof, with 85% of the roof area is available for solar, and that solar is installed at 15 W/ft2, which is easily attainable with most solar panels. 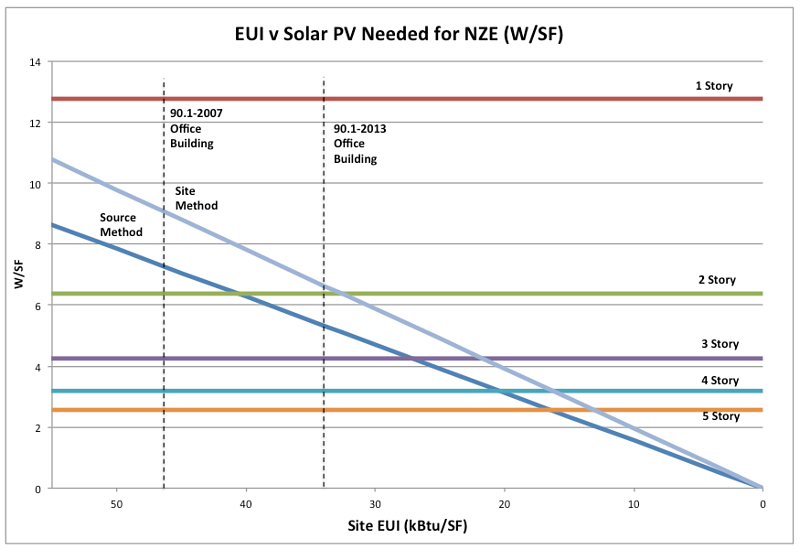 That said, in all these scenarios the hurdle in achieving NZE is not making the economics of solar power work. If you have a roof that can accommodate a significant amount of solar PV (say, >100kW), then it is likely a better economic proposition to install solar rather than buy electricity from the electric grid, using a solar power purchase agreement (PPA), PACE financing, or some other financing vehicle. This depends on a lot of things: the utility incentives available, a given state’s net metering rules (many of which are likely to be in flux in the coming months or years), the presence of PACE enabling legislation, and the cost of electricity, but favorable conditions are often available to make solar work. The chart shows the relationship between several aspects of building size, shape, and energy use when thinking about pursuing NZE. As energy efficiency increases, or, in other words, energy use intensity (EUI) goes down, the amount of solar collection area needed reduces proportionally (shown by the two diagonal lines). The horizontal lines represent the amount of solar roof collection area per square foot of building area. A shorter building has more roof area per square foot of building area than a taller building, which makes it easier to pursue a NZE goal. To chart your course for NZE, you can aim for the level of efficiency required given the amount of roof area you have available for photovoltaic panels. To find the NZE EUI target for your building, follow the diagonal lines down to where they meet the horizontal lines. For reference, the vertical lines on the chart show the efficiency of a new office building built to code (ASHRAE 90.1-2007 or 90.1-2013). For a one- or two-story office building, getting to NZE is relatively easy. If you have a three-story building, things start to get a little harder, as you need to be in the 20–25 kbtu/ft2 site EUI range. For a four-story building, you need to be in the 15–20 kbtu/ft2 site EUI range. And for a five-story building, you need to be in the 10–15 kbtu/ft2 site EUI range. The chart assumes a building with a site energy profile of 70% electricity and 30% natural gas, by the way. For context, getting to an EUI of 20 is really hard. The new two-story RMI headquarters in Basalt, Colorado is targeting an EUI of 17, and that represents the absolute best in efficient design. NREL’s four-story Research Support Facility building has an EUI of 33–35 (including a data center). The Bullitt Center has an EUI of 16, and, as mentioned, it employs a canopy to allow for a solar collection area that is greater than the building footprint. Most new office buildings are still in the range of 30–40 EUI. The chart shows two diagonal lines, one each representing a way to calculate NZE: source versus site. The “Source” method is based on the new Department of Energy (DOE) definition of NZE (which it refers to as Zero Energy Buildings, or ZEB), which essentially says to separately determine the source energy use of natural gas and electricity (and any other fuels used onsite fuels), and to offset this usage using onsite renewables. Source energy factors in the energy used to make and transport the energy you use; in the case of natural gas, it takes 1.09 units in source energy to deliver one unit of gas. The “Site” method, by contrast, only looks at site energy usage, and the PV offsets the amount of site energy that it produces with no source energy factors. The “Source” method tends to be an easier pathway for NZE if you are using gas, because gas, with a source energy factor of 1.09, is assumed to be offset by electricity from PV at a source energy factor of 3.17—the gas energy is discounted. Note that while there is a published definition for the Source method, there is no third-party certification program. By contrast, the Site method can be certified using the NZE certification program from the International Living Future Institute (ILFI), with the caveat that ILFI allows no onsite combustion (which means no gas anyway). If your building is all electric anyway, the site and the source method work out to be the same goal.